We are nearing the end of 2018 when we will hold our 2018 Fall Open House on Sunday November 18th from 5-8pm. Join us for some food, drinks, and great fellowship with other archers. You will be able to sign-up for winter league, obtain your 2019 membership, and purchase stock. The winter league with start the first full week of December and run for 14 weeks. This year the league will be split into two 7 week leagues. The first 7 weeks’ will be a 450 vegas round. The second 7 weeks’ format will be a NFAA 300 round format. Come out to our Fall Open House for more details on each league format. Shooting starts between 5:30 and 6:30pm EVERY Tuesday night, June 5th – September 27th. 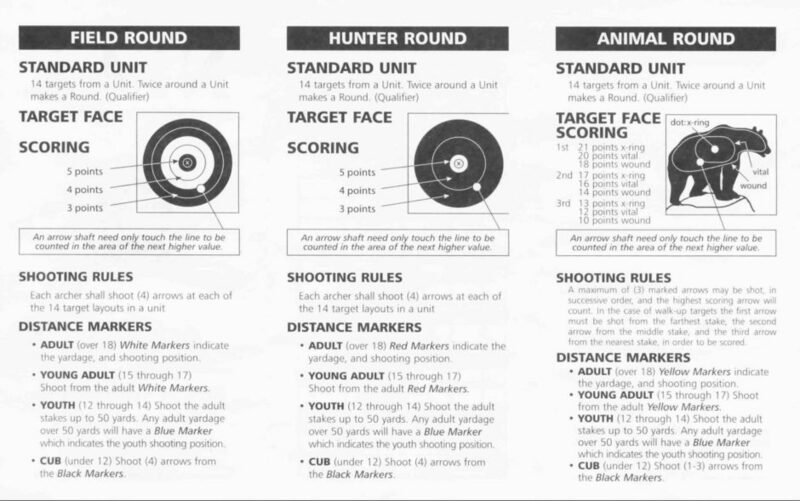 Participating archers will place $5 in the pot for members and non-members will place $5 in the pot and pay $5 for range use before shooting. Archers will shoot the assigned range (North or South) with at least one other partner. When all shooters have completed their round, we will draw blind partners and the highest total scoring team will split the pot! Each Tuesday night there will be a new pot…so you only need to shoot the nights you can make it!! The range choice will be decided each night. The second range will be used for a fun night of family shooting. Enjoy a burger or brat when you are finished! As usual, current members can shoot the range without contributing to the pot, but won’t be included in the drawing. The end date will be dependent upon level of interest to continue and daylight hours. The credit for this photo is unknown. If you know who should be credited please let us know and we will add it. Here are some options for campgrounds and lodging near Saratoga Archery Club. There may be more options available. Please contact us if there are other options that should be added. Here is a list of the results for the 45+ Target 3D Shoot on July 29 & 30, 2017. Thank you to all who participated and volunteered your time to make this shoot a success! We are nearing the end of 2016 when we will hold our 2016 Fall Open House on Sunday November 20th from 5-7pm. Join us for some food, drinks, and great fellowship with other archers. You will be able to sign-up for winter league, obtain your 2017 membership, and purchase stock.